Crown Industrial offers a wide variety of standard and custom attachment chain and conveying chain. We stock a large assortment of roller chain components and ASME standard attachments to be able to provide custom assembly to your specifications, generally in 5 business days or less. Matched strands are available when required for conveying applications or other applications where tighter length tolerances are needed. Basic matching services are done at no extra cost, and do not extend the delivery date. We can also provide basic modifications such as special hole sizes or locations, and special pin lengths. Lead times vary for these products, so contact us today for delivery times for your requirements. Crown Industrial can also fabricate and deliver totally custom products for your unique application. 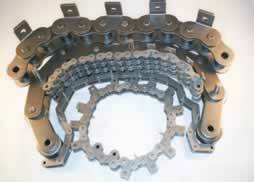 We have a variety of options for tooling and fabrication of our custom attachment or conveying chains.